When rivers are low and clear, I often dread "bluebird days". Bluebird day is defined as clear blue skies, bright sun, and warm temperatures. For many, that's considered the ideal fishing weather. I, on the other hand, prefer dank grey skies, no sun and temperatures hovering just above freezing. Today, it was a bluebird day and I wasn't going to wish for awful weather. Weather on the Alley can be fickled at best and fishing time is precious. As I do most of the time, I'll deal with the conditions the best I can. Daylight savings couldn't come at a better time. No more stumbling around in the dark and it's only 7:00 A.M and for this hopeless sleeper, an extra hour is what I need. I really didn't feel the need to get up early because the word out was the fishing has been terrible ever since the rivers came down. Not a lot of fish made it in and they're spread out. Many steelheaders used the beautiful weather to score points with the wife in regards to raking leaves and tossing the patio furniture in the shed. It was first light when I was halfway out to the Grand, driving at a leisurely pace as I listened Rush's Exit Stage Left. This would be the second trip out to the upper stretches and I hoped it would be better than the previous one, but I wasn't holding my breath. I crossed over the covered bridge below the dam, the final stop for steelhead about 20 miles from the lake. I could see several anglers clustered around the bridge. I knew from past experience that the fish will move downstream whenever the water the gets lower. Whenever the rivers are low and clear, I'll fish the Grand. The Grand was one of those rivers that never runs clear. It always has that murkiness to it. I know the river very well, but there are times that she doesn't want to reveal her secrets or her fish. The upper stretches are where I'm at home - the long shale cliffs, lazy flats, and the remoteness. As I pulled in to the back lot, there wasn't anybody fishing downstream. The large rock that I use as a gauge was halfway out of the water. That meant the river was low but perfect for wading as I had the plan to fish the 2 miles downstream. Unfortunately, I looked across to see a large drift boat being loaded. As for their destination? Hopefully, a lot further where I was planning on fishing. 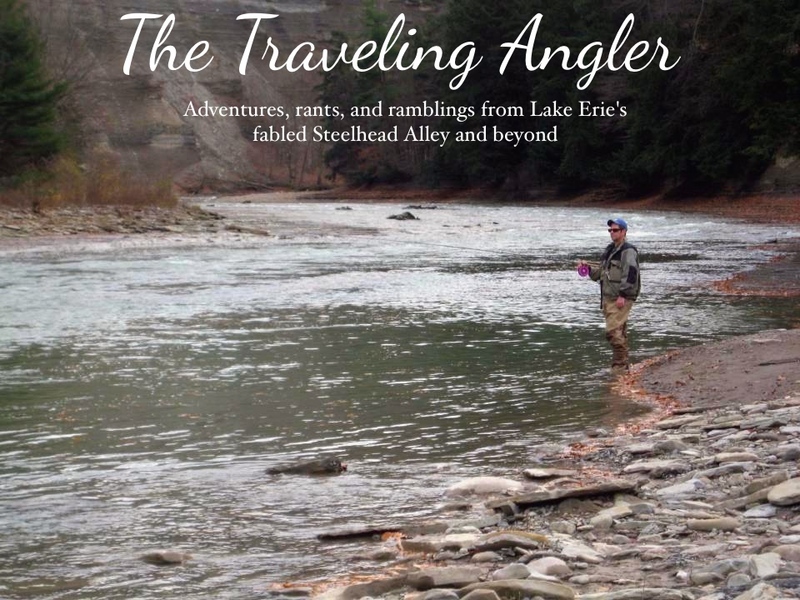 Even though the Grand is one of the largest steelhead rivers in Ohio, it's very shallow. With three people in the boat, I'm expecting them to bottom out a lot and the boat to take a beating. I try not to worry, but I don't linger about as I immediately hit the trail. I immediately walked down to one of my favorite pools. The river is moving at a lazy pace. The water is tea stained and I can make out some rocks at the bottom. Even though it's early November there are plenty leaves on the trees. I stand on the bank, watching the water swirl and move. I scan the pool on where to cast out. I watch the bubbles race around some of the rocks. I start the process of working the pool. It doesn't take long to get into the first fish of the morning. The float chugs along and quickly goes under. I set the hook and feel the line surge upstream. The fish darts about the pool, but I'm in control as it's not a large fish. I swing the fish over in the slack water and it's a male, bright in his fall colors. I pop the hook out and fish quickly takes off as I wash my hands in the cool water. Upstream, I hear the banging of the boat as it goes over the riffles. The banging hull echoes all the way downstream. I can see the guide whince whenever the boat grinds over a rock. They eventually drift by me and we exchange greetings. Not once did he ask how the fishing was. I noticed that they had fly fishing gear, so that meant they would most likely past up the water along the cliffs. I had an idea where they were going to fish. I continue to work the pool and there were no more fish to be had. By now the boat was long gone. It was very odd not seeing people fishing during the first week of November - the prime month of steelheading on the Alley. Perhaps it was the weekend to rake leaves or do other yard work. But it most likely the negative reports of poor fishing was the reason for the lack of people out. I start to feel hot as the sun feels stronger. My fleece jacket is becoming a burden and I'm relieved to take it off when I get to the Jeep. 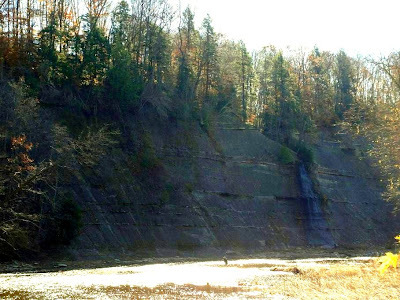 I get back on the road and make the quick drive to Hogsback Ridge Metropark. I pull into the lot and there's plenty of cars. 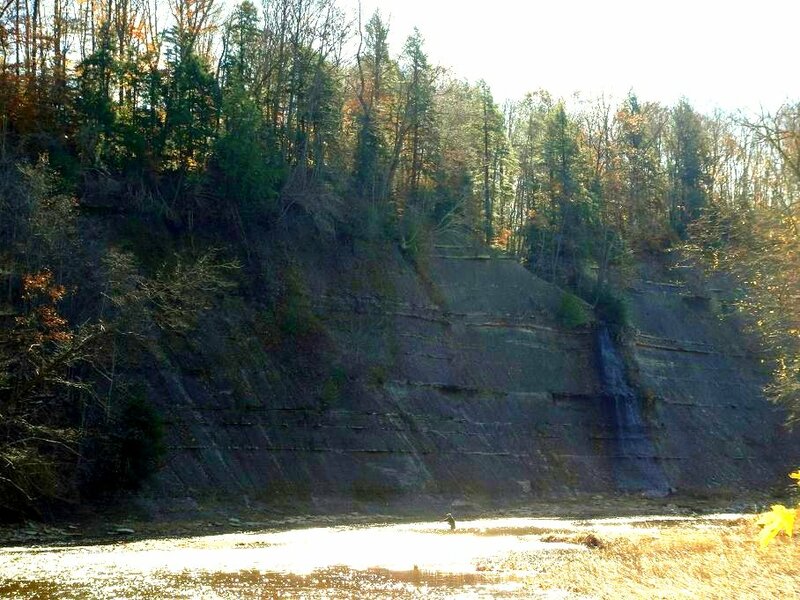 But, I suspect most of them are people hiking down to Mill Creek to see the waterfalls. I don't blame them as it's a beautiful day to get out and enjoy one of the last few remaining warm days before winter. I head down the trail and I see a couple of anglers walking up. Both of them had that grim look on their faces. The look of defeat and frustration. One them asked if I fished upstream and said yes but it was slow. We talk as they were both were not from here. They were picking my brain to see what their best options were. and I was hard pressed to give them any info that would help them. They were thankful and wished me luck. I walk down the trail and there I see the feeder creek, it's barely trickling. In the spring, some fish go up to spawn. In some spots you can pratically jump across it. The water is crystal clear and I don't see any steelhead hiding under the lumber. I get to the river and I see one angler downstream by the cliffs. I start fishing at the mouth of the creek. The clear water of the creek mixes with the main river and the water here is much cleaner. I work the run and there's no takers. I look down and the other angler that was fishing is gone. I head down the pool is moving at a nice leisurely pace. The pool is long and sweeping and the bottom is scattered with rocks. I look at the time and it's almost noon. I've decided that this will be the last spot to fish. I squint as I look at water. The sun's rays sparkle off the water as I try to figure out where if any fish are holding. I work the pool until I finally throw in the towel. I use hunger and thrist as an excuse to call it a day. The wind is getting stronger as leaves start falling into the river. I look high above and see several people hanging by the fence on the cliff taking pictures. I make the long walk back, huffing and puffing up the hill. I'm dragging my feet by the time I get to the lot. I'm fortunate that I was able to catch a couple of fish. I know that better days will come and vacation week starts after Thanksgiving. I stop to get lunch and wolf down the burger and fries. I call a couple of friends and tell them that the day was slow and they were better off getting yard work done. Lucky for me, I live in an apartment so there's no yard work for me. I finally get home, plop myself on the couch and take a nap. I had my fill of this bluebird day. Has The Internet Ruined Fishing?